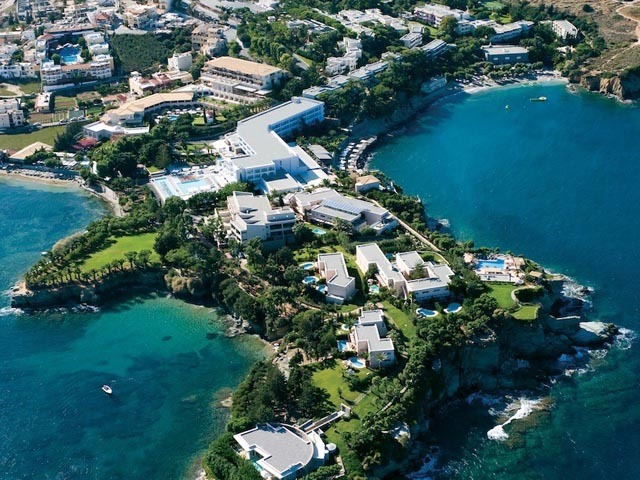 Following a 25-million euro reconstruction, the Out of the Blue, Capsis Elite Resort gone for its final lift to reach perfection. 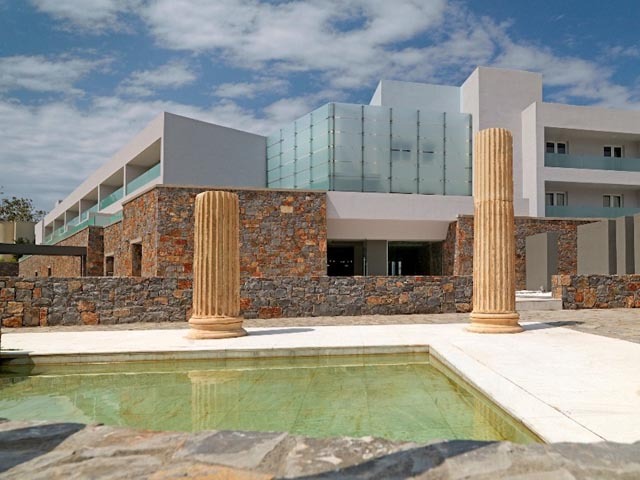 The main building of the resort complex, up-to-now known as Capsis Beach Hotel is currently undergone a total renovation and now is called the “Crystal Energy Hotel”. The existing building changed to a modern and luxurious 5-stars deluxe hotel offering spacious one-bedroom suites. 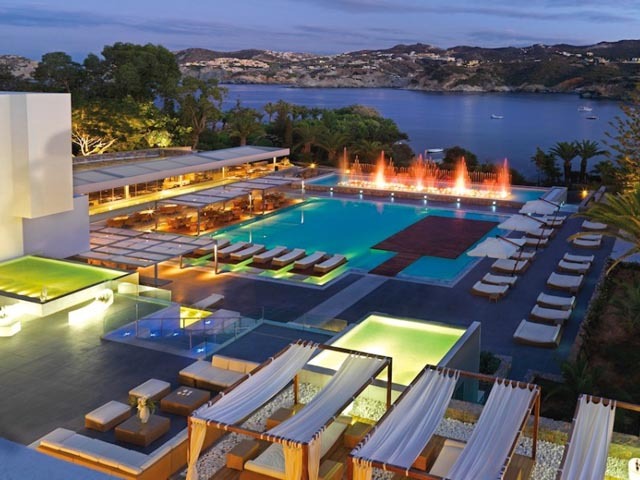 The concept for the creation of this hotel is to create a central hotel for the resort where people can meet, shop and amuse themselves in the different restaurant and bar facilities created. 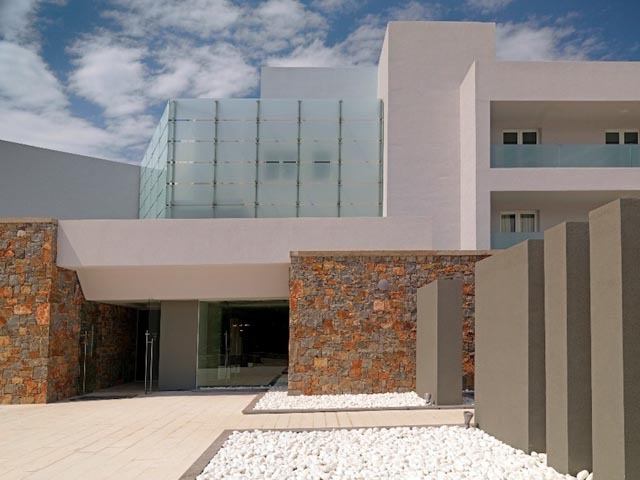 The interior decor of this hotel has a great emphasis on comfort and modern art architecture. 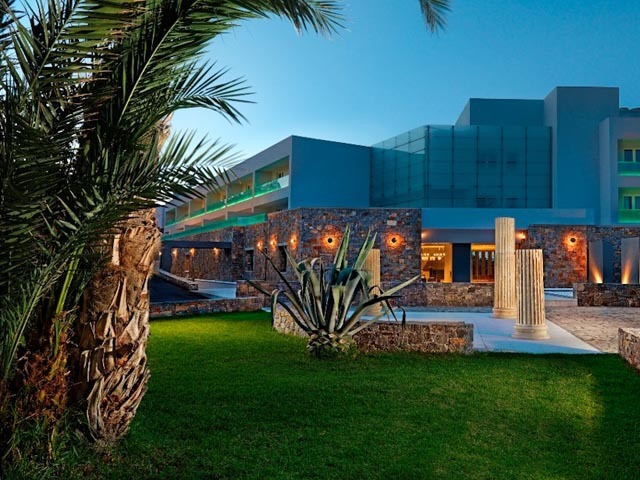 The hotel offers guests a new luxurious lobby area with shops, new bar/lounge, new gym with sea views, a new swimming pool with an exclusive gourmet restaurant and virtual bowling. It features art mosaic mannequins from the company Sicis and the external design is minimal and luxurious as the whole property. 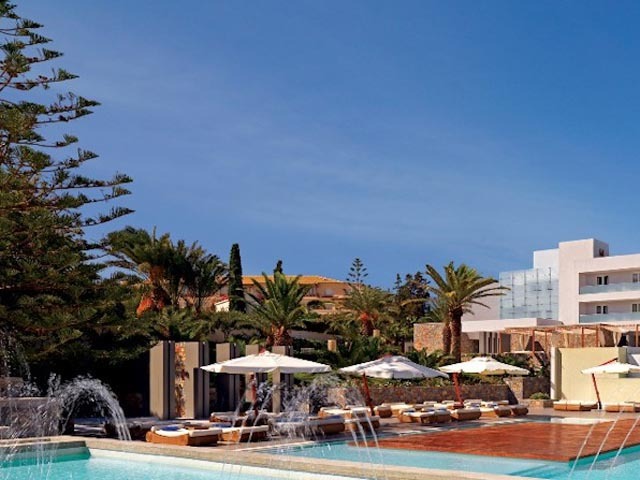 The Crystal Energy Hotel is situated in the centre of the resort hotel complex, giving it excellent access to the other resort restaurants, bars, beaches and swimming-pools. 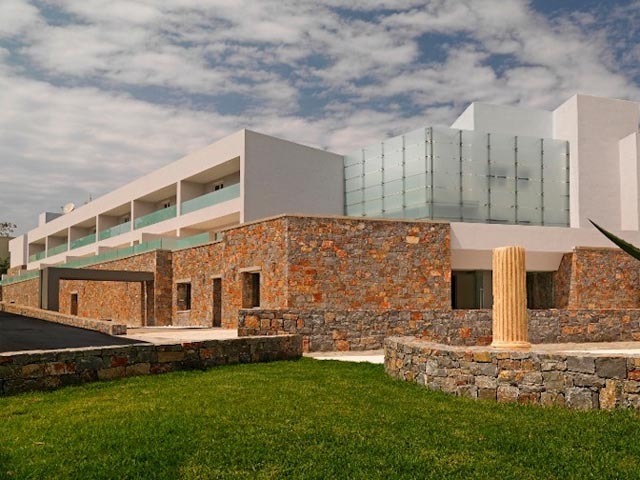 It is surrounded by gardens and located on the tip of the peninsula, overlooking the St. Athanasios Chapel and the Cladissos private hotel beach. 20 airlines connect Heraklion to major European cities 20 daily flights between Heraklion and the new Athens “Eleftherios Venizelos” Airport Ferry boats to Heraklion Port daily from the Piraeus Port of Athens. Make sure to ask the hotel sommelier to guide you through the Precieux cellar and introduce you to an extensive selection of vintage wines and champagnes collected and chosen especially from vineyards around the world. (100 guests indoors & outdoors). The menu is put together by the Italian executive chef Gianluca Guglielmi. (200 guests outdoors). The menu is put together by the famous 2-star Michelin executive chef Arnaud Bignot (of the awarded Spondi restaurant in Athens). (260 guests indoors & outdoors). Only children over the age of 10 are permitted in this restaurant. (650 guests indoors & outdoors). The menu features the fresh catch of the day, a variety of the famous delicious Greek “Meze” along with a large selection of the finest Greek wines and spirits. (620 guests indoors & outdoors). 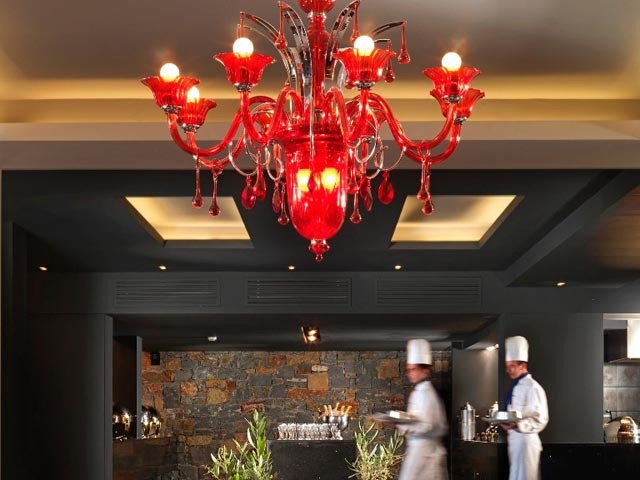 It operates only for dinner and it offers traditional Cretan dishes and specialities, desserts, wines & spirits. (80 guests indoors & outdoors). The restaurant is available during dinner hours. (200 guests indoors & 80 outdoors). 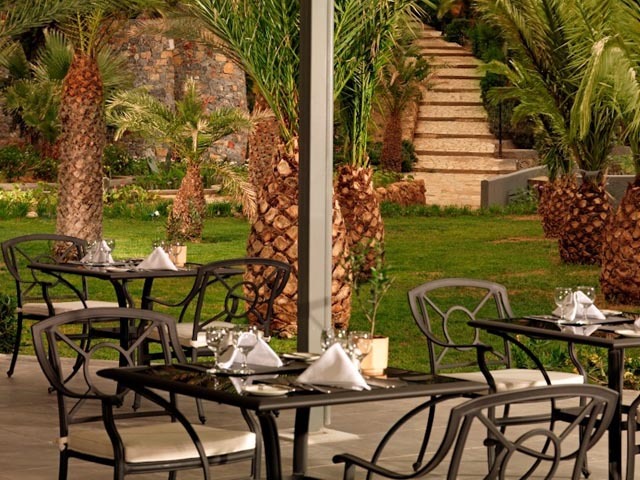 The bar extends to a beautiful veranda, overlooking the sea and hotel gardens. (10 guests indoors & outdoors). Children over the age of 16 are permitted in this bar where Live Soft Piano music, 6 times per week, will accompany your get away. (120 guests indoors & outdoors). Enjoy relaxing moments surrounded by the lush gardens of this beautiful Oasis. (20 guests outdoors). It operates only during the summer period, daily during daytime. (800 guests outdoors). Cladissos Cliff Bar Located on the cliffs in front of the sea, next to the Cladissos Beach and under the Crystal Energy Hotel, this bar operates only during the summer period and for private functions, cocktails and receptions. (150 guests outdoors). Ypu are welcome to enjoy delicious snacks and desserts throughout the day allowing yourself to feel free and play like children! (15 guests indoors). 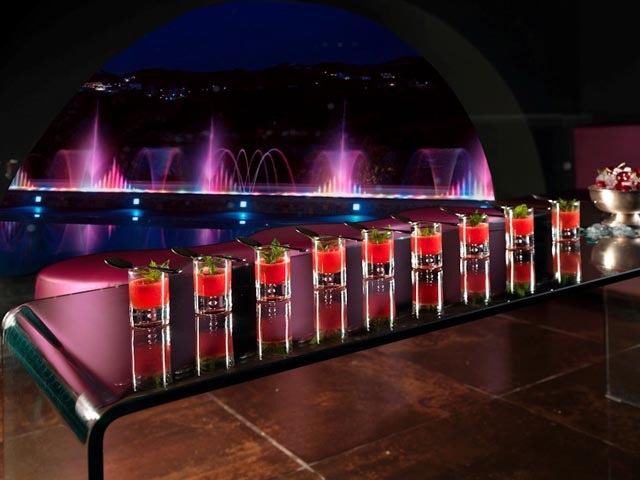 Dazzle Bar Located at the Crystal Energy Hotel, this brand new disco is the absolute place for fun, dance & entertainment offering alcoholic & non-alcoholic drinks & various kinds of beverages. (40 guests indoors & 60 outdoors). The above special discounted prices are valid only for leisure markets and inclusive of American buffet breakfast, taxes and services charge. For Promo Free Half Board Rooms a minimum stay of 7 nights is required. Minimum stay policy of 3 nights is required except from 16/7 - 27/8, when the minimum stay policy requires 7 nights stay. 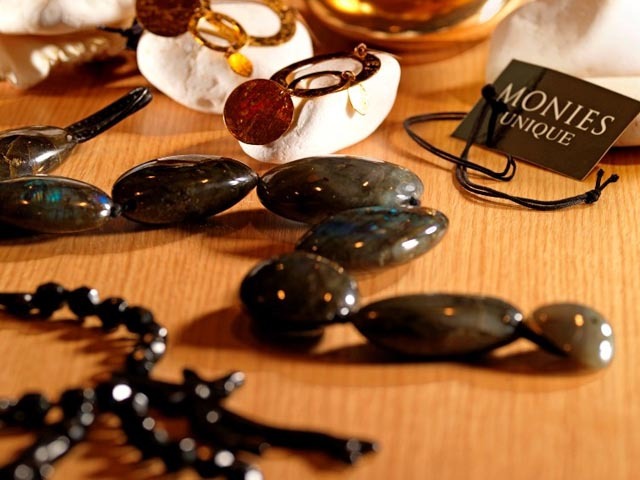 The prices are valid for all markets except the Greek, Cypriot and Former CIS Markets. In the event that a booking is proved to have been made for any guest participating in any Conference, Congress, Seminar, Incentive or any other event taking place at that time in the hotel, above rates will not be applicable and booking arrangements may need to be done or handled directly through the official organizer of the conference / meeting, at the prevalent or published rate of the conference / meeting. The Half Board for adults can be taken as lunch or dinner at the Red Pepper Mediterranean buffet Restaurant (change to be notified with 24 hour notice) and no credit allowance will be granted in any of the other restaurants. For the children (up to 14 years old) the Half-Board can be taken as lunch or dinner at the Red Pepper Restaurant or as a set menu available in all other restaurants when dining with parents. o “The amount of 500 Euros” per room per week for any booking with a daily accommodation value of € 2000 or more. to be credited on guest room account to be used on consumption within all hotel departments, with the exception of the shops and boutiques. This offer is not deductable from the accommodation rate. This offer can be combined with all other offers. When paying full rate of Half-Board Supplement, “Dine-Around Allowance Vouchers of 15 € per adult or 7,5 € per child” can be provided in case clients wish to exchange their HB meals from the Main Restaurant Red Pepper to any a la carte Restaurant within the Resort. This offer can only be combined with the above offer and with special offer 14=10 or 7=5 nights stay. NOTE: wedding certificate mandatory before arrival to the hotel upon confirmation of the reservation. If a booking has been cancelled 30 days before arrival no cancellation fees are charged except the ones about administration fees and the credit card expenses. If a booking has been cancelled 16 days before arrival a cancellation fee equal to 100% of the total reservation cost will be charged. For confirmed bookings till 30/04/12 based on the early booking offer 's temrs, the 50% is non-refundable but can be used towards future reservations within Summer Season 2012. For cancellations received up to 14 days for periods A+B and 21 days for the Priod C ( 06/07-28/08) the amount paid will be retained but can be fully reinstated with a future booking during the Season 2013, subjected to hotels availability. For cancellations received 13 to 1 day for periods A+B and 20 to 1 das for the Period C prior to arrival or in case of NO SHOW, late arrival or early deparure the full value for all reserved and confirmed services will be retained as a reasonable cancellation Fee.